This Delta<sup></sup> faucet provides a practical, hardworking solution that will stand the test of time, every time. Delta is a reflection of your personality and is as individual as you are. Collins offers a sleek design with the charm of cimplicity. Delta's DIAMOND Seal Technology provides a pure water delivery system. Our InnoFlex waterways are crosslinked with an electron beam versus using chemicals to eliminate the potential of adding unpleasant odors or taste. Delta ShieldSpray Technology cleans with laser-like precision while containing mess and splatter. A concentrated jet powers away stubborn messes while an innovative shield of water contains splatter and clears off the mess, so you can spend less time soaking, scrubbing and shirt swapping. Delta MagnaTite Docking uses a powerful integrated magnet to pull your faucet spray wand precisely into place and hold it there so it stays docked when not in use. Delta faucets with diamond Seal Technology perform like new for life with a patented design which reduces leak points, is less hassle to install and lasts twice as long as the industry standard. Kitchen faucets with Touch-Clean Spray Holes allow you to easily wipe away calcium and lime build-up with the touch of a finger. You can install with confidence, knowing that Delta faucets are backed by our Lifetime Limited Warranty. Industry standard is based on ASME A112.18.1 of 500,000-cycles..
Cassidy Two Handle Kitchen Faucet with Spray in Chrome This Delta<sup></sup> faucet provides a practical, hardworking solution that will stand the test of time, every time. Delta is a reflection of your personality and is as individual as you are. 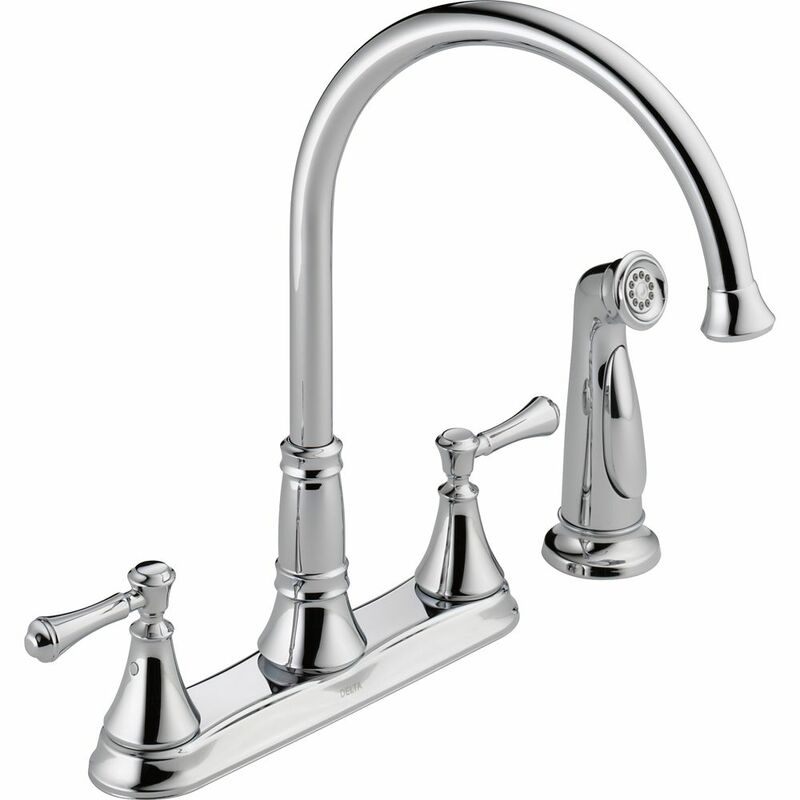 Cassidy Two Handle Kitchen Faucet with Spray in Chrome is rated 4.3 out of 5 by 61. Rated 5 out of 5 by Quitepleased from This faucet works great. I replaced a similar looking faucet... This faucet works great. I replaced a similar looking faucet that cost less, but the handle on that one broke, so I bought this one, and it was easy to install and works beautifully. Rated 5 out of 5 by Alice from I never thought I would like the elevated spout, but not sure why, it is just great for cleaning ... I never thought I would like the elevated spout, but not sure why, it is just great for cleaning your larger pots and pans. Rated 5 out of 5 by Glenda from I just think the faucet is beautiful!!... I just think the faucet is beautiful!! Rated 5 out of 5 by Hj from Installed with ease. Installed with ease. Rated 5 out of 5 by BFam93 from Great faucet. Bought it as a replacement for a more expensive model of similar design and it loo... Great faucet. Bought it as a replacement for a more expensive model of similar design and it looks great. I like the squeeze sprayer, it's better for little hands than a handle on top. Just installed it so I don't know how it's going to hold up. We'll see.